This ferment tastes good fermented and non-fermented (I had to sneak a taste, it smelled so good while pounding). I really enjoy how Indian spices lend themselves to ferments. No wonder India is know for their spices and pickles! I’m trying to do ferments that are in season. One of the reasons we ferment is to preserve the fruits in vegetables in season so we can enjoy them out of season. But what is in season in North Dakota in March? Nothing. So I’m focusing on root vegetables that have may have made it this far in the season as well as beans, water and milk kefir, kombucha and sourdough. I can’t wait until we start getting some fresh grown veggies from our local CSA. I’m sure radishes will be up first and I have a few ideas. 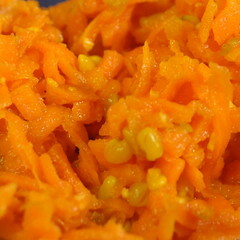 Shred carrots either with a grater or in a food processor. Place in a large non-reactive bowl and add remaining ingredients. Mix well and let rest for about 15 mins. By now the salt should have released the juices from the carrots. You can mash it a bit with a kraut pounder, wooden spoon or just squeeze in your hands. Spoon into a fermentation vessel, pressing down so the carrots are submerged in their juices. If not enough juice is produced, add 2% brine to cover (19 gms sea salt per 1 quart water). Use a weight to keep the carrot submerged. Cover and let set at room temperature for about 5 days or until activity dies down. Move to cold storage. Could you add cabbage to this instead of using a starter or whey? You bet! Juice from any fermented veggie makes a great starter culture or just add extra salt. I’m going to try this – thanks! I’ve been meaning to put fermented foods back into our diet and we LOVE Indian spices. Thanks! Hi I asked a similiar question in your celery recipe. You responded to an earlier question- abotu adding fermented cabbage to this instead of the whey or starter you wrote – You bet! Juice from any fermented veggie makes a great starter culture or just add extra salt. So if you have the juice from some fermented veggie, it would still be the 1/4 cup of that juice, and no extra salt needed. Also does the sugar content of the carrots get consumed in a similiar way that say the sugars do when making water kefir? Curious. Juice from fermented veggies is the best option actually next to Caldwell vegetable starter. Yes, a 1/4 cup of that is perfect with no extra salt. I usually keep a jar of pickle or kraut juice in the fridge for that purpose (it tastes good to add a tablespoon to broth as well). Hello there Melanie. Thank you so much for an amazing blog. I made these carrots and they ARE over the moon wonderful, delicious. I see so many recipes on your website that I am really looking forward to trying. I am relatively new to fermenting vegetables and have been a little nervous about it for some reason. But the results I have had so far coupled with your amazing recipes have me so excited to continue and experiment. Thank you so so much. Yay! I’m so glad you like them. Thank you! You say to leave the carrots out to ferment on the counter for 5 days and then move to cold storage. At what point can you start eating the carrots? You can start enjoying them right away. They might taste pretty fresh at first but will get more pickly flavored with time. Is dried or fresh turmeric best? Fresh is best if you can get it but dried works just fine. I too am interested in using brine from a previous ferment in another batch. I see in the comments to use 1/4 cup with no additional salt. In order to completely cover my veggies, I need to add more liquid. Do I just add plan water or make up more brine ? Thanks for your help and recipes !